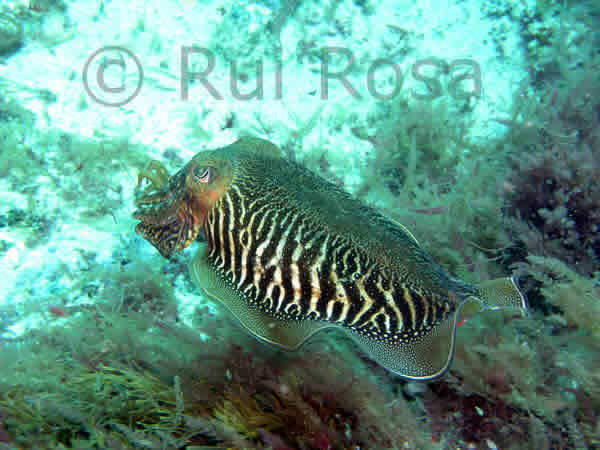 Rosa, R. Pierce, G., O´Dor, R. (2013) Advances in Squid Biology, Ecology and Fisheries. Part I, Myopsid squids. New York: Nova Publishers. 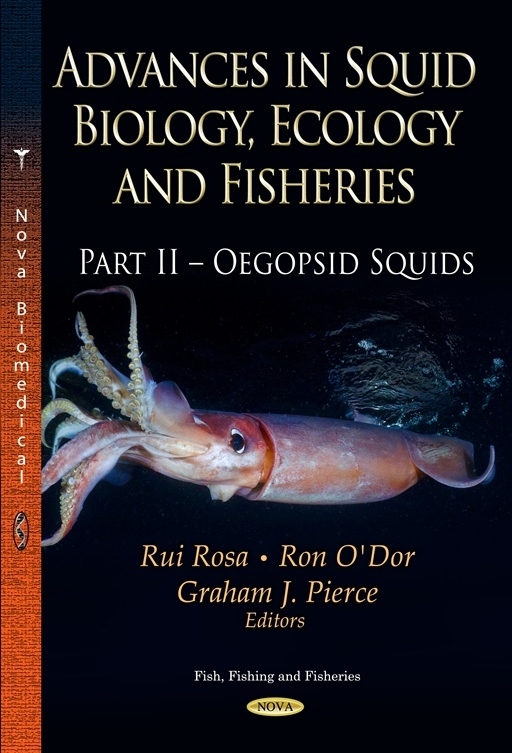 331 p.
Rosa, R. Pierce, G., O´Dor, R. (2013) Advances in Squid Biology, Ecology and Fisheries. Part II, Oegopsid squids. New York: Nova Publishers. 281 p.
Dionísio G., Rosa R. (in prep). Snails, slugs and cephalopods. In: Marine Ornamental Species Aquaculture (R. Calado, I. Olivotto, M. Planas, Holt, G., Eds.). Oxford, Wiley-Blackwell. Rosa, R., Yamashiro, C., Markaida, U., Rodhouse, P., Waluda, C.M., Salinas, C.A., Keyl, F., O´Dor, R., Stewart, J.S., Gilly, W.F. (2013) Dosidicus gigas , Humboldt squid. In: Advances in Squid Biology, Ecology and Fisheries. 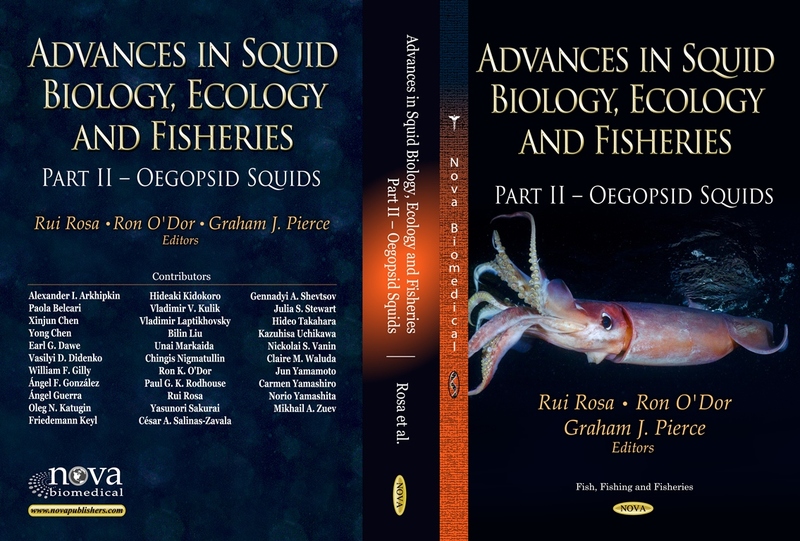 Part II, Oegopsid squids (R. Rosa, G. Pierce, R. O´Dor, Eds.) New York: Nova Publishers, pp. 169-206. Moreno, A., Boavida-Portugal, J., Pimentel, M, Pereira, J., Rosa, R. (2013) Loligo vulgaris , European squid. 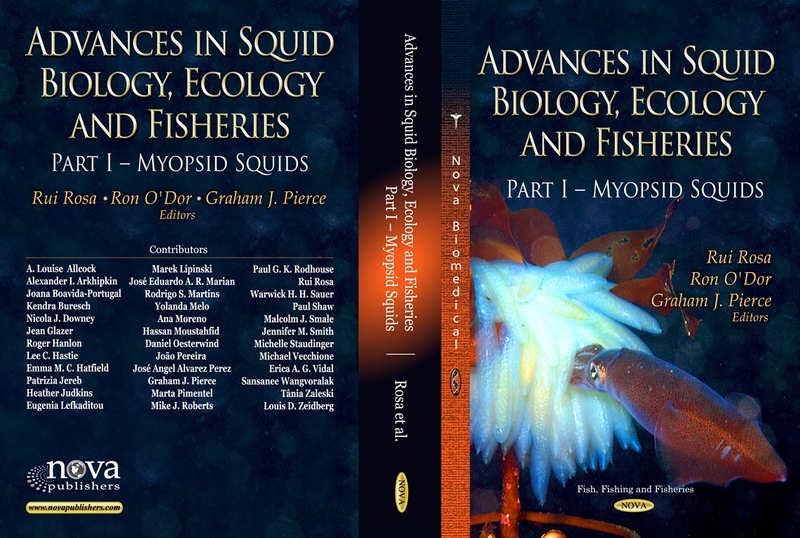 In: Advances in Squid Biology, Ecology and Fisheries. 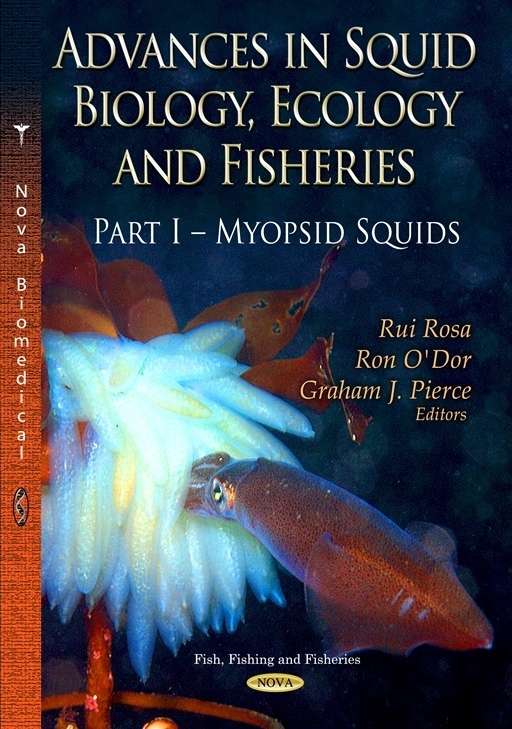 Part I, Myopsid squids (R. Rosa, G. Pierce, R. O´Dor, Eds.) New York: Nova Publishers, pp. 1-30. Rosa, R., Marques, A., Nunes, M.L. (2013) Mediterranean aquaculture in a changing climate. In: The Mediterranean Sea: Its History and Present Challenges (S. Goffredo, H. Baader, Z. Dubinsky, Eds). Berlin, Springer-Verlag. Marques, A., Rosa, R., Nunes, M.L. (2013) Seafood safety and human health implications. In: The Mediterranean Sea: Its History and Present Challenges (S. Goffredo, H. Baader, Z. Dubinsky, Eds). Berlin, Springer-Verlag. In press. Rosa, R. (2010). Connecting biogeographic patterns with energy and resource availability in marine systems. In: Biogeography (M. Gailis, S. Kalnins, Eds. ), New York: Nova Publishers. pp. 63-104. 123. Boavida-Portugal, J., Guilhaumon, F., Rosa, R. & Araújo, M.B. (submitted) Cephalopods like it hot: climate change impacts on coastal cephalopod diversity. Global Change Biology. 122. Rosa, R., Barreiros, J.P., Lopes, V.M., Paula, J.R., Kelly, J.T., Gonçalves, J. & Hanlon, R. (submitted) Hijacking, hitchhiking and burglary behaviors of pelagic octopuses. Biology Letters. 121. Figueiredo, C., Baptista, M., Lopes, A.R., Dionisio, G., Rosa, I., Paula, J.R., Repolho, T., Cabecinhas, A., Rocha, R.J.M., Cruz, I.G.C., Kikuchi, R.K.P., Simões, N., Leal, M.C., Tojeira, I., Bandarra, N., Calado, R. & Rosa, R. (submitted) World-wide 3D chemoecology and chemotaxonomy of hexa- and octocorals. The Science of Nature. 120. Lopes, A.R., Baptista, M. Dionísio, G., Rosa, I., Paula, J.R., Gomes-Pereira, J., Figueiredo, C., Bandarra, N., Calado, R. & Rosa, R. (submitted) Gone with the wind: fatty acid biomarkers and chemotaxonomy of stranded free-floating hydrozoans (Velella velella and Physalia physalis). Comparative Biochemistry and Physiology B. 119. Pires, V.L., Pimentel, M.S., Baptista, M., Faleiro, F., Dionísio, G., Paula, J.R., Repolho, T. & Rosa, R. (submitted). Impact of global warming on the spawning success and embryogenesis of a specialized soft coral-feeding nudibranch, Armina maculata. Marine Biology. 118. Maulvault, A.L., Anacleto, P., Chaguri, M., Rosa, R., Carvalho, M.L., Nunes, M.L., Marques, A. (submitted) Assessing the quality of farmed rope grown blue mussels (M. edulis) from different farming areas, and the risk and benefits of their consumption as human food. British Food Journal. 117. Maulvault, A.L., Custódio, A., Anacleto, P., Repolho, T., Pousão, P., Nunes, M.L., Diniz, M., Rosa, R. & Marques, A. (submitted) Bioaccumulation and elimination of mercury in juvenile seabass (Dicentrarchus labrax) under ocean warming. Environmental Research. 116. Rey, F.E., Moreira, A.S.P., Ricardo, F., Coimbra, M.A., Domingues, R.M., Domingues, P., Rosa, R., Queiroga, H. & Calado, R. (submitted) Fatty acids of highly-packed embryos of Carcinus maenas reveal homogenous maternal provisioning and no within-brood variation at hatching. Marine Biology. 115. Leal, M.C., Cruz, I.S., Mendes, C.R.B., Calado, R., Kikuchi, R.K., Rosa, R., Soares, A.M.V.M., Serôdio, J., Rocha, R.J. (accepted pending minor revisions) Photobiology of the zoanthid Zoanthus sociatus in differently exposed intertidal habitats. Marine and Freshwater Research. 114. Rosa, R., Pimentel, M., Galan, J.G., Baptista, M., Lopes, V.M., Santos, C., Calado, R. & Repolho, T. (accepted pending revisions) Deficit in digestive capabilities of shark early stages under climate change. Marine Biology. 113. Rosa, R., Pimentel, M., Lopes, A.R., Baptista, M., Lopes, V.M., Paula, J.R., Campos, D., Almeida-Val, V.M.F., Calado, R. & Repolho, T. (submitted) Neuro-oxidative damage and aerobic potential loss of sharks under climate change. Scientific Reports. 112. Trübenbach, K., Repolho, T., Baptista, M., Pegado, M.R., Fiedler, B., Körtzinger, A. & Rosa, R. (accepted pending revisions) Acid-base regulation during long-term environmental hypercapnia and warming in a deep-sea spiny lobster (Palinurus mauritanicus). Journal of Comparative Physiology B. 111. Pimentel, M.S., Faleiro, F., Dionísio, G., Faria, A.M., Machado, J., Paula, J.R., Peck, M.A., Pörtner, H., Gonçalves, E.J. & Rosa, R. (accepted pending revision) Foraging behaviour, swimming performance and malformations of commercially important fish larvae under ocean acidification and warming. Climate Research. 110. Lopes, V.M., Faleiro, F., Baptista, M., Pimentel, M.S., Paula, J.R., Bandarra, N., Anacleto, P., Marques, A. & Rosa, R. (accepted pending revisions) Impact of ocean warming on the amino and fatty acid dynamics of octopus (Octopus vulgaris) early life stages. Journal of Thermal Biology. 109. Lopes, A.F., Munday, P.L., Pimentel, M., Rosa, R., Gonçalves, E.J., Faria, A.M. (accepted pending revisions) Disruption of behavioural lateralization and shoaling cohesion of fish larvae under ocean acidification. Journal of Experimental Marine Biology and Ecology. 108. Rey, F., Alves, E., Melo, T., Domingues, P., Queiroga, H., Rosa, R., Domingues, M.R.M. & Calado, R. (2015) Unravelling polar lipids dynamics during embryonic development of two sympatric brachyuran crabs (Carcinus maenas and Necora puber) using lipidomics. Scientific Reports. In Press. 107. Pimentel, T., Rocha, R.J.M., Rosa, R., Soares, A.M.V.M., Gomes, N.C.M., Leal, M.C., & Calado, R. (2015). Bacterial communities from corals cultured ex situ remain stable under different light regimes - relevance for in toto aquaculture. Aquaculture 450: 258–261. 106. Pimentel, M.S., Faleiro, F., Diniz, M., Machado, J., Pousão-Ferreira, P., Peck, M.A., Pörtner, H.-O. & Rosa, R. (2015). Oxidative stress and digestive enzymatic activity of flatfish larvae in a changing ocean. PLoS One 10(7): e0134082. 105. Leal, M.C., Vaz, M.C.M., Puga, J., Rocha, R.J.M., Brown, C., Rosa, R. & Calado, R. (2015) Marine ornamental fish imports in the European Union: an economic perspective. Fish and Fisheries. In press. 104. Rocha, R.J.M., Serôdio, J., Bontas, B., Cartaxana, P., Leal, M.C., Ferreira, J.M., Rosa, R. & Calado, R. (2015). Development and validation of a standardized modular system for experimental coral culture. Journal of the World Aquaculture Society 46: 235-251. 103. Leal, M.C., Pimentel T., Ricardo, F., Rosa, R. & Calado, R. (2015) Seafood traceability: current needs, available tools and biotechnological challenges for origin certification. Trends in Biotechnology. In press. 100. Xavier, J.C., Allcock, L., Cherel, Y., Hoving, H.-J., Lipinski, M., Gomes-Pereira, J.N., Piatkowski, U., Pierce, G., Rodhouse, P.G., Rosa, R., Liz Shea, L., Strugnell, J., Vidal, E., Villanueva, R. & Ziegler, A. (2015) The future challenges in cephalopod research for the next decade. Journal of the Marine Biological Association of the United Kingdom 95(5): 999-1015. 99. Rosa. I.C., Raimundo, J., Lopes, V.M., Brandão, C., Couto, A., Santos, C., Cabecinhas, A.S., Cereja, R., Calado, R., Caetano, M. & Rosa, R. (2015) Cuttlefish capsule: an effective shield against contaminants in the wild. Chemosphere 135: 7-13. 98. Guerreiro, M., Rosa, R., Cherel, Y., Phillips, R.A., Ceia, F.R., Alvito, P. & Xavier, J. (2015) Distribution and trophic ecology of Southern Ocean cephalopods using the diet of the wandering albatross: a stable isotopes approach. Marine Ecology Progress Series 530:119-134. 96. Faleiro, F., Santos, C., Aurélio, M.L., Baptista, M., Pimentel, M., Calado, R., Repolho, T. & Rosa, R. (2015). Seahorses under a changing ocean: the impact of ocean warming and acidification on a poor swimmer bony-armoured fish. Conservation Physiology 3: 1-7. 93. Rey, F., Neto, G.M.S., Rosa, R., Queiroga, H. & Calado, R. (2015) Laboratory trials reveal that exposure to extreme raining events prior to metamorphosis affect the post-settlement performance of an estuarine crab. Estuarine, Coastal and Shelf Science 154: 179-183. 92. Anacleto, P., Maulvault, A.L., Nunes, M.L., Carvalho, M.L., Rosa, R. & Marques, A. (2015) Effects of depuration on metal levels and health status of bivalve molluscs. Food Control 47: 493-501. 91. Baptista, M., Repolho, T., Maulvault, A.L., Lopes, V.M., Narciso, L., Marques, A., Bandarra, N. & Rosa, R. (2014) Temporal dynamics of amino and fatty acid composition in the razor clam Ensis siliqua. Helgoland Marine Research 68 (4): 465-482. 89. Rosa, R., Lopes, A., Pimentel, M.S., Faleiro, F., Baptista, M., Trübenbach, K., Narciso, L., Dionísio, G., Pegado, M.R., Repolho, T., Calado, R. & Diniz, M. (2014). Ocean’s cleaning stations under a changing climate: biological responses of tropical and temperate fish-cleaner shrimps to global warming. Global Change Biology 20: 3068-3079. 87. Anacleto, P., Maulvault, A.L., Bandarra, N., Repolho, T., Nunes, M.L., Rosa, R. & Marques, A. (2014) Effect of warming on protein, glycogen and fatty acid content of native and invasive clams. Food Research International 64: 439-445. 86. Seibel, B. A., Häfker, N. S., Trübenbach, K., Zhang, J., Tessier, S. N., Pörtner, H.O., Rosa, R. & Storey, K. B. (2014) Metabolic suppression during protracted exposure to hypoxia in the jumbo squid, Dosidicus gigas, living in an oxygen minimum zone. Journal of Experimental Biology 217: 2555-2568. 85. Leal, M.C., Sheridan, C., Osinga, R., Dionísio, G., Rocha, R., Silva, B., Rosa, R. & Calado, R. (2014 ) Drug discovery from marine microorganism-invertebrate assemblages: perspectives to solve the �supply problem'. Marine Drugs 12: 3929-3952. 84. Pimentel, M., Faleiro, F., Dionísio, G., Repolho, T., Pousão-Ferreira, P., Machado, J. & Rosa, R. (2014) Defective skeletogenesis and oversized otoliths in fish early stages in a changing ocean. Journal of Experimental Biology 217: 2062-2070. 83. Anacleto, P., Maulvault, A.L., Lopes, V.M., Repolho, T., Diniz, M., Nunes, M.L., Marques, A. & Rosa, R. (2014) Ecophysiology of native and alien invasive clams under an ocean warming context. Comparative Biochemistry and Physiology A 175: 28-37. 82. Raimundo, J., Vale, C. & Rosa, R. (2014) Trace element concentrations in the top predator jumbo squid (Dosidicus gigas) from the Gulf of California. Ecotoxicology and Environmental Safety 102: 179-186. 81. Pimentel, M., Pegado, M., Repolho, T. & Rosa, R. (2014) Impact of ocean acidification in the metabolism and swimming behavior of the dolphinfish (Coryphaena hippurus) early larvae. Marine Biology 161: 725-729. 80. Calado, R., Leal, M.C., Vaz, M.C.M., Brown, C., Rosa, R., Stevenson, T.C., Cooper, C.H., Tissot, B.N., Li, Y.-W.8 9, Thornhill, D.J. (2014) Caught in the Act: how the U.S. Lacey Act can hamper the fight against cyanide fishing in tropical coral reefs. Conservation Letters. In press. 79. Rosa, R., Trübenbach, K., Pimentel, M.S., Boavida-Portugal, J., Faleiro, F., Baptista, M., Calado, R., Pörtner, H.O. & Repolho, T. (2014) Differential impacts of ocean acidification and warming on winter and summer progeny of a coastal squid (Loligo vulgaris). Journal of Experimental Biology 217: 518-525. (Featured article - Inside JEB). 78. Trübenbach, K., Costa, G., Ribeiro-Silva, C., Mesquita, R., Cordeiro, C. & Rosa, R. (2014) Hypoxia-driven selective degradation of cellular proteins in jumbo squids during diel migration to the oxygen minimum zones. Marine Biology 161: 575-584. 76. Anacleto, P., Barrento, S., Nunes, M.L., Rosa, R. & Marques, A. (2014) Portuguese consumers' attitudes and perceptions of bivalve molluscs. Food Control 41: 168-177. 75. Repolho, R., Baptista, M., Pimentel, M.S., Dionísio, G., Trübenbach, K., Lopes, V.M., Lopes, A.R., Calado, R., Diniz, M. & Rosa, R. (2014) Developmental and physiological challenges of octopus (Octopus vulgaris) e arly life stages under ocean warming. Journal of Comparative Physiology B 184: 55-64. 74. Lopes, V.M, Repolho, T., Baptista, M., Rosa, R. & Costa, P.R. (2014) Uptake, transfer and elimination kinetics of paralytic shellfish toxins in common octopus (Octopus vulgaris). Aquatic Toxicology 146: 205-211. 73. Trübenbach, K., Teixeira, T., Diniz, M. & Rosa, R. (2013) Hypoxia tolerance and antioxidant defense system of jumbo squids in oxygen minimum zones. Deep-Sea Research Part II 95: 209-217. 72. Leal, M.C., Munro, M.H.G., Blunt, J.W., Puga, J., Jesus, B., Calado, R., Rosa, R. & Madeira, C. (2013) Biogeography and biodiscovery hotspots of macroalgal marine natural products. Natural Product Reports 30 (11): 1380-1390. 71. Aurélio, M., Faleiro, F., Lopes, V.M., Pires, V., Lopes, A.R., Pimentel, M.S., Repolho, T., Baptista, M., Narciso, L. & Rosa, R. (2013) Physiological and behavioral responses of temperate sea horses (Hippocampus guttulatus) to environmental warming. Marine Biology 160 (10): 2663-2670. 70. Rocha, J.M., Pimentel, T., Serôdio, J., Rosa, R. , Calado, R. (2013) Comparative performance of light emitting plasma (LEP) and light emitting diode (LED) in ex situ aquaculture of scleractinian corals. Aquaculture 402-403: 38-45. 69. Cruz, J., Garrido, S., Pimentel, M.S., Rosa, R., Santos A.M.P. & Ré, P. (2013) Reproduction and respiration of a climate change indicator species: effect of temperature and variable food supply in the copepod Centropages chierchiae . Journal of Plankton Research 35 (5): 1046-1058. 68. Anacleto, P., Pedro, S., Nunes, M.L., Rosa, R. & Marques, A. (2013) Microbiological composition of native and exotic clams from Tagus estuary: effect of season and environmental parameters. Marine Pollution Bulletin 74: 116-124. 67. Lopes, V.M., Lopes, A.R., Costa, P.R. 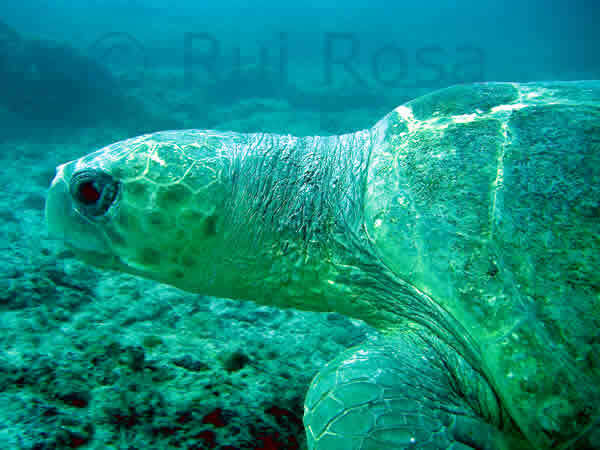 & Rosa, R. (2013) Cephalopods as vectors of Harmful Algal Bloom toxins in marine food webs. Marine Drugs 11: 3381-3409. 66. Lopes, A.R., Trübenbach, K., Teixeira, T., Lopes, V.M., Pires, P., Baptista, M., Repolho, T., Calado, R., Diniz, M. & Rosa, R. (2013) Oxidative stress in deep scattering layers: heat shock response and antioxidant enzymes activities of myctophid fishes thriving in oxygen minimum zones. Deep-Sea Research Part I 82: 10-16. 64. Anacleto, P., Maulvault A.L., Chaguri, M., Pedro, S., Nunes, M.L., Rosa, R. & Marques, A. (2013) Microbiological responses to depuration and transport of native and exotic clams at optimal and stressful temperatures. Food Microbiology 36(2): 365-373. 63. Vinagre, C., Narciso, L., Pimentel, M., Cabral, H., Costa, M.J. & Rosa, R. (2013) Contrasting impacts of climate change across seasons: effects on flatfish cohorts. Regional Environmental Change 13(4): 853-859. 62. Madeira, D., Vinagre, C., Rosa, R., Costa, P.M., Costa, M.H., Caeiro, S., Galésio, M., Santos, H.M., Nuñez, C., Oliveira, E., Castro, L., Peres, I., Lodeiro, C., Capelo, J.L., Diniz, M.S. (2013) Sea warming affects bream (Sparus aurata) tissues and stress proteins (HSP70). Microscopy and Microanalysis 19 (Suppl 4): 83-84. 61. Rosa, R., Dionísio, G., Bensimon-Brito A., Pimentel, M.S., Trübenbach K., Moreno, A., Barquinha, P., Diniz, M. (2013) Are squid statoliths hollow during embryogenesis? Microscopy and Microanalysis 19 (Suppl 4): 89-90. 60. Anacleto, P., Maulvault , A.L., Barrento, S., Mendes, R., Nunes, M.L., Rosa, R. & Marques, A. (2013) Physiological responses to depuration and transport of native and exotic clams at different temperatures. Aquaculture 408-409: 136-146. 59. Dionísio, G., Rosa, R., Leal, M.C., Cruz, S., Brandão, C., Calado G., Serôdio J., & Calado, R. (2013) Beauties and beasts: a portrait of sea slugs aquaculture. Aquaculture 408-409: 1-14. 58. Czudaj, S., Pereira, J., Moreno, A., Saint-Paul, U. & Rosa, R. (2013) Distribution and reproductive biology of Rondeletiola minor (Sepiolidae, Cephalopoda) from the Portuguese Coast. Marine Biology Research 9(8): 802-808. 57. Baptista, M., Maulvault, A.L., Trübenbach, K., Narciso, L., Marques, A. & Rosa, R. (2013) Amino acids in the octocoral Veretillum cynomorium: the effect of seasonality and differences from scleractinian hexacorals. Journal of the Marine Biological Association of the United Kingdom 93: 913-918. 56. 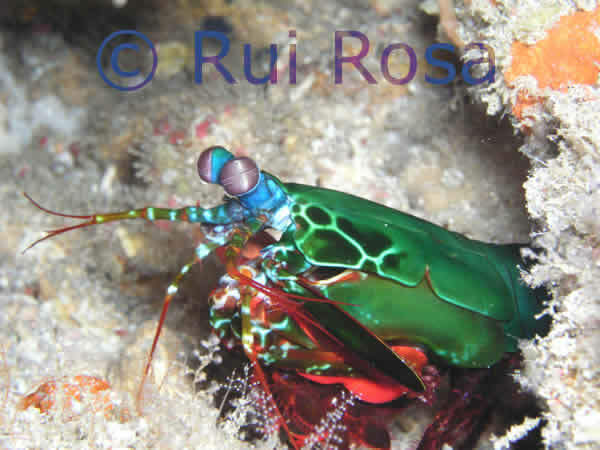 Leal, M.C., Pochelon , P.N., da Silva, T.L., Reis, A., Rosa, R. & Calado, R. (2013) Variable within-brood maternal provisioning in newly extruded embryos of Homarus gammarus. Marine Biology 160: 763-772. 55. Rosa, R., Pimentel, M.S., Baptista, M., Trü benbach, K., Calado, R., Nunes, M.L., Moreno, A. & Pereira, J. (2013) Trophic and reproductive biochemistry of a deep-sea gelatinous octopus, Opisthoteuthis calypso. Marine Biology 160: 263-275. 54. Trübenbach, K., Pegado, M.R., Seibel, B.A. & Rosa R. (2013) Ventilation rates and activity levels of jumbo squids under metabolic suppression in the oxygen minimum zones. Journal of Experimental Biology 216 (3): 359-368. 53. 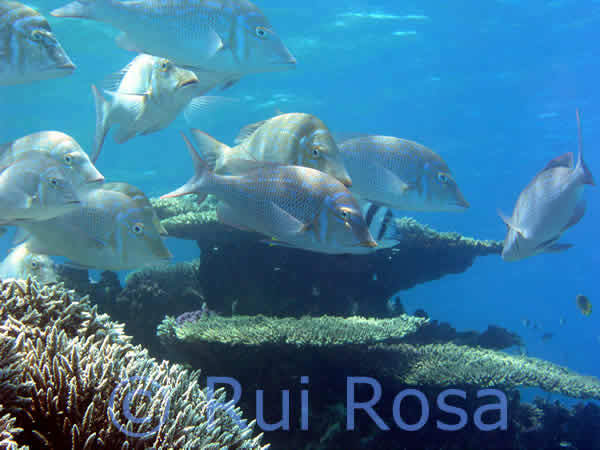 Teixeira, T., Diniz, M., Calado, R. & Rosa, R. (2013) Coral physiological adaptations to air exposure: heat shock and oxidative stress responses in Veretillum cynomorium. Journal of Experimental Marine Biology and Ecology 439: 35-41. 52. Cruz, S., Dionisio, G., Rosa, R., Calado, R. & Serôdio, J. (2012) Anesthetizing solar-powered sea slugs for photobiological studies. Biological Bulletin 223 (3):328-336. 51. Rosa, R., Gonzalez, L., Dierssen, H.M. & Seibel B.A. (2012) Environmental determinants of latitudinal-size trends in cephalopod mollusks. Marine Ecology Progress Series 464: 153-165. 50. Rosa, R., Marques, M. & Nunes, M.L. (2012) Impact of climate change in Mediterranean aquaculture. Reviews in Aquaculture 4 (3): 163-177. 49. Rosa, R., Pimentel, M.S., Boavida-Portugal, J., Teixeira, T., Trübenbach, K. & Diniz, M.S. (2012) Ocean warming enhances malformations, premature hatching, metabolic suppression and oxidative stress in the early life stages of a keystone invertebrate. PLOS One 7(6): e38282. doi:10.1371/journal.pone.0038282. 48. Pimentel, M.S., Trübenbach, K., Faleiro, F., Boavida-Portugal, J., Repolho, T. & Rosa, R. (2012) Impact of ocean warming on the early ontogeny of cephalopods: a metabolic approach. Marine Biology 159: 2051-2059. 47. Rosa, R., Boavida-Portugal, J., Trübenbach, K., Baptista, M., Araújo, R. & Calado, R. (2012) Descending into the abyss: bathymetric patterns of diversity in decapod crustaceans shift with taxonomic level and life strategies. Deep-Sea Research Part I 64: 9-21. 46. Lopes, V.M., Baptista, M., Pimentel, M.S., Narciso, L. & Rosa, R. (2012) Reproduction in Octocorallia: spawning and asynchronous oogenesis in pennatulid Veretillum cynomorium. Marine Biology Research 8: 893-900. 45. Baptista, M., Lopes, V.M., Pimentel, M.S., Bandarra, N., Narciso, L., Marques, A. 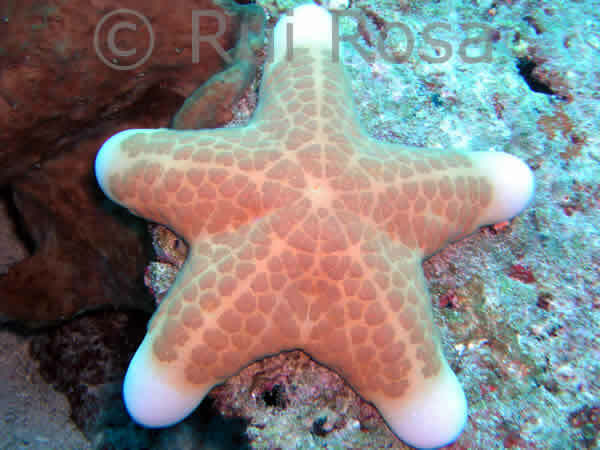 & Rosa, R. (2012) Temporal fatty acid dynamics of the octocoral Veretillum cynomorium. Comparative Biochemistry and Physiology B 161: 178-187. 44. Czudaj, S., Pereira, J., Moreno, A., Costa, A.M., Saint-Paul, U. & Rosa, R. (2012) Distribution, abundance, reproduction and ageing of the common bobtail squid Sepietta oweniana (Sepiolidae, Cephalopoda) from the Portuguese Coast. Marine Biology Research 8: 74-86. 43. Vinagre, C., Narciso, L., Cabral, H., Costa, M. J. & Rosa, R. (2012) Coastal versus estuarine nursery grounds: effect of differential temperature and heat waves on juvenile seabass, Dicentrarchus labrax. Estuarine, Coastal and Shelf Science 109: 133-137. 42. Rosa, R., Gonzalez, L., Broitman, B., Garrido, S., Santos, A.M.P. & Nunes, M.L. (2010) Bioenergetics of small pelagics in upwelling systems: relationship between fish condition, coastal ecosystem dynamics and fisheries. Marine Ecology Progress Series 410: 205-218. 41. Rosa, R. & Seibel, B.A. (2010) Metabolic physiology of the Humboldt squid, Dosidicus gigas: implications for vertical migration in a pronounced oxygen minimum zone. Progress in Oceanography 86: 72-80. 40. Rosa, R. & Seibel B.A. (2010) Slow pace of life of Antarctic colossal squid. Journal of the Marine Biological Association of the United Kingdom 90, 1375-1378. 39. Rosa, R. & Seibel B.A. (2010) Voyage of the Argonauts in the pelagic realm: physiological and behavioral ecology of the rare paper nautilus, Argonauta nouryi . ICES Journal of Marine Science 67 (7): 1494-1500 . 38. Rosa, R., Andrade, A.M., Bandarra, N.M. & Nunes, M.L. (2010) Physiological and biochemical effects of conjugated linoleic acid and its use in aquaculture. Reviews in Aquaculture 2: 59-72. 37. Rosa, R., Trueblood, L. & Seibel, B.A. (2009) Ecophysiological influence on scaling of aerobic and anaerobic metabolism of oceanic gonatid squids. Physiological and Biochemical Zoology 82 (5) : 419-429. 36. Rosa, R., Pereira, J., Moreno, A. & Nunes, M.L. (2009) Bathymetric range, density and reproductive biology of the deep-sea cirrate octopus Opisthoteuthis calypso in the Portuguese slope. Journal of the Marine Biological Association of the United Kingdom 89 (1): 131-134. 35. Rosa, R. & Seibel B.A. (2008) Synergistic effects of climate-related variables suggest future physiological impairment in a top oceanic predator. Proceedings of the National Academy of Sciences of the United States of America 105: 20776-20780. 34. Rosa, R., Dierssen, H.M., Gonzalez, L. & Seibel B.A. (2008) Large-scale diversity patterns of cephalopods in the Atlantic open ocean and deep-sea. Ecology 89:3449-3461. 33. Wiklund, A.K.E., Sundelin, B. & Rosa, R. (2008) Population decline of amphipod Monoporeia affinis in Northern Europe: consequence of food shortage and competition? Journal of Experimental Marine Biology and Ecology 367:81-90. 32. Rosa, R., Dierssen, H.M., Gonzalez, L. & Seibel B.A. (2008) Ecological biogeography of cephalopod mollusks in Atlantic Ocean: historical and contemporary causes of coastal diversity patterns. Global Ecology and Biogeography 17 (5): 600-610. 31. Garrido, S., Rosa, R. , Ben-Hamadou, R., Cunha, M.E., Chícharo, M.A. & van der Lingen C.D. (2008) Spatial-temporal variability in fatty acid trophic biomarkers in stomach contents and muscle of Iberian sardine (Sardina pilchardus): and its relationship with spawning. Marine Biology 154: 1053-1065. 30. Sundelin, B., Rosa, R. & Wiklund, A.K.E. (2008) Reproduction disorders in the benthic amphipod: an effect of low food quality and availability. Aquatic Biology 2: 179-190. 29. Rosa, R., Calado, R., Narciso, L. & Nunes, M.L. (2007) Embryogenesis of decapod crustaceans with different life histories traits, feeding ecologies and habitats: a fatty acid approach. Marine Biology 151 (3) : 935-947. 28. Garrido, S., Rosa, R., Ben-Hamadou, R., Cunha, M.E., Chícharo, M.A. & van der Lingen C.D. (2007) Effect of maternal fat reserves on the fatty acid composition of sardine ( Sardina pilchardus ) oocytes. Comparative Biochemistry and Physiology B 148: 398-409. 27. Rosa, R., Bandarra, N.M. & Nunes, M.L. (2007) Nutritional quality of African catfish Clarias gariepinus (Burchell 1822): a positive criterion for the future development of the European production of Siluroidei. International Journal of Food Science and Technology. 42 (3): 342-351. 26. Rosa, R., Pereira, J., Costa, P.R. & Nunes, M.L. (2006) Distribution, abundance, biology and biochemistry of the stout bobtail squid Rossia macrosoma from the Portuguese coast. Marine Biology Research 2(1): 14-23. 25. Rosa, R., Pereira, J., Nunes, M.L. (2005) Biochemical composition of cephalopods with different life strategies, with special reference to a giant squid Architeuthis sp. Marine Biology 146 (4): 739-751. 24. Rosa, R., Calado, R., Andrade, A.M., Narciso, L. & Nunes, M.L. (2005) Changes in amino acids and lipids during embryogenesis of European lobster, Homarus gammarus (Crustacea: Decapoda). Comparative Biochemistry and Physiology B 140: 241-249. 23. Calado, R., Figueiredo, J., Rosa, R., Nunes, M.L. & Narciso, L. (2005) Effects of different temperatures, rearing densities and larval diets on development, survival, settlement synchronism and fatty acid profile of the ornamental shrimp Lysmata seticaudata . Aquaculture 245 (1-4): 221-237. 22. Pereira, J., Rosa, R. , Moreno, A., Henriques, M., Sendão, J. & Borges, T. (2005) First recorded specimen of the giant squid Architeuthis sp. in Portugal. Journal of the Marine Biological Association of the United Kingdom. 85: 175-176. 21. Calado, R., Rosa, R., Morais, S., Nunes, M.L. & Narciso, L. (2005) Growth, survival, lipid and fatty acid profile of juvenile Monaco shrimp Lysmata seticaudata fed on different diets. Aquaculture Research 36: 493-504. 20. Rosa, R. & Nunes, M.L. (2005) Seasonal patterns of nucleic acid concentrations and amino acid profiles of Parapenaeus longirostris (Crustacea, Decapoda) : relation to growth and nutritional condition. Hydrobiologia 537 (1-3): 207-216. 19. Costa, P.R., Rosa, R., Duarte-Silva, A., Brotas, V. & Sampayo, M.A.M. (2005) Accumulation, transformation and tissue distribution of domoic acid, the amnesic shellfish poisoning toxin, in the common cuttlefish, Sepia officinalis. Aquatic Toxicology 74: 82-91. 18. Rosa, R., Costa, P.R., Bandarra, N. & Nunes, M.L. (2005) Changes in tissue biochemical composition and energy reserves associated with sexual maturation in the ommastrephid squids Illex coindetii and Todaropsis eblanae. Biological Bulletin 208 (2): 100-113. 17. Calado, R., Rosa, R., Nunes, M.L. & Narciso, L. (2005) Amino and fatty acid dynamics of Lysmata seticaudata (Decapoda: Hippolytidae) embryos during early and late reproductive season. Marine Biology 147: 341-351. 16. Costa, P.R., Rosa, R. , Pereira, J. & Sampayo, M.A.M. (2005) Detection of domoic acid, the amnesic shellfish toxin, in the digestive gland of Eledone cirrhosa and E. moschata (Cephalopoda, Octopoda) from the Portuguese coast. Aquatic Living Resources 18: 395-400. 15. Rosa, R., Costa, P.R. & Nunes, M.L. (2004) Effect of sexual maturation in the tissue biochemical composition of Octopus vulgaris and O. defilippi (Mollusca, Cephalopoda). Marine Biology 145 (3): 563-574. 14. Rosa, R. & Nunes, M.L. (2004) RNA, DNA and protein concentrations and amino acid profiles of deep-sea decapod Aristeus antennatus: an indication for seasonal variations of nutrition and growth. Aquatic Living Resources 17: 25-30. 13. Costa, P.R., Rosa, R. & Sampayo, M.A.M. (2004) Tissue distribution of the amnesic shellfish toxin, domoic acid, in Octopus vulgaris from the Portuguese coast. Marine Biology 144: 971-976. 12. Rosa, R., Marques, A.M., Nunes, M.L., Bandarra, N. & Sousa Reis, C. (2004) Spatial-temporal changes in dimethyl acetal (octadecanal) levels of Octopus vulgaris (Mollusca, Cephalopoda): relation to feeding ecology. Scientia Marina 68 (2): 227-236. 11. Rosa, R., Costa, P.R., Pereira, J. & Nunes, M.L. (2004) Biochemical dynamics of spermatogenesis and oogenesis in Eledone cirrhosa and E. moschata (Cephalopoda: Octopoda). Comparative Biochemistry and Physiology B 139 (2): 299-310. 10. Rosa, R. & Nunes, M.L. (2004) Nutritional quality of red shrimp, Aristeus antennatus (Risso) , pink shrimp, Parapenaeus longirostris (Lucas) and Norway lobster, Nephrops norvegicus (Linnaeus). Journal of Food Science and Agriculture 84 (1) : 89-94. 9. Rosa, R. & Nunes, M.L. (2003) Biochemical composition of deep-sea decapod crustaceans with two different benthic life strategies in the Portuguese south coast. Deep-Sea Research Part I 50 (1): 119-130. 8. Rosa, R. & Nunes, M.L. (2003) Tissue biochemical composition in relation to the reproductive cycle of deep-sea decapod Aristeus antennatus in the south Portuguese coast. Journal of the Marine Biological Association of the United Kingdom 83: 963-970. 7. Rosa, R., Morais, S., Calado, R., Narciso, L. & Nunes, M.L. (2003) Biochemical changes during the embryonic development of Norway lobster, Nephrops norvegicus (Crustacea: Decapoda). Aquaculture 221 (1-4): 507-522. 6. Rosa, R. & Nunes, M.L. (2003) Seasonal changes in nucleic acids, amino acids and protein content in juvenile Norway lobster (Nephrops norvegicus). Marine Biology 143 (3): 565-572. 5. Rosa, R. & Nunes, M.L. (2002) Biochemical changes during the reproductive cycle of deep-sea decapod Nephrops norvegicus on the south Portuguese coast. Marine Biology 141 (6): 1001-1009. 4. Morais, S., Narciso, L., Calado, R., Nunes, M.L. & Rosa, R. (2002). Lipid dynamics during the embryonic development of Plesionika martia martia (Decapoda; Pandalidae), Palaemon serratus and Palaemon elegans (Decapoda; Palaemonidae): relation to metabolic consumption. Marine Ecology Progress Series 242: 195-204. 3. Rosa, R., Nunes, M.L. & Sousa Reis, C. (2002) Seasonal changes in the biochemical composition of Octopus vulgaris , Cuvier, 1797, from three areas of the Portuguese coast. Bulletin of Marine Science 71 (2): 739-751. 2. Rosa, R. & Nunes, M.L. (2002) Influence of the reproductive cycle on the biochemical composition of deep-sea decapod Parapenaeus longirostris in the Portuguese south coast . Journal of Shellfish Research 21 (2): 843-849. 1. Rosa, R. & Nunes, M.L. (2002) Changes in organ indices and lipid dynamics during the reproductive cycle of Aristeus antennatus, Parapenaeus longirostris and Nephrops norvegicus (Decapoda) from the Portuguese south coast. Crustaceana 75 (9): 1095-1105.